The Canberra Library Tribe invites readers, library lovers and GLAMR staff and students are all invited to join local author L.J.M. Owen to discuss her Canberra-based crime fiction series ‘Dr Pimms, Intermillennial Sleuth’. With archaeologists and librarians, ancient murder and family secrets, this is one series where the skeletons don’t stay buried. We’ll explore the historical research behind the first book in the series, ‘Olmec Obituary’, and L.J. will introduce – spoiler free – the history behind the second instalment ‘Mayan Mendacity’. 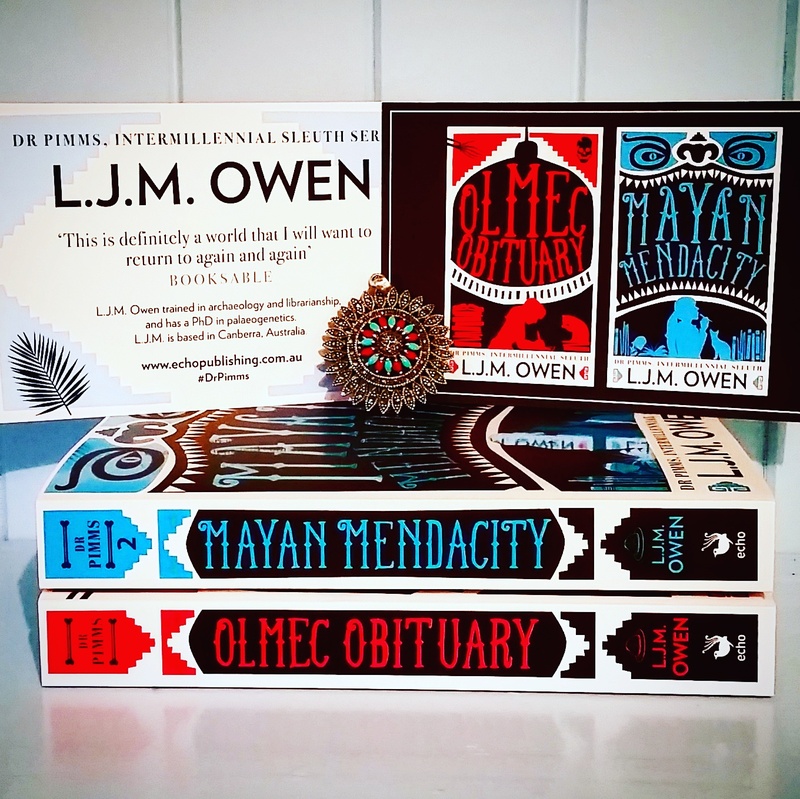 There’ll be plenty of time to discuss your ideas about the themes, settings, characters and plot of ‘Olmec Obituary’ as well as ask questions of the author. ‘Olmec Obituary’ is available at a number of libraries in the ACT region and copies may be purchased from the National Library Bookshop. Arrangements may also be made via the Canberra Library Tribe for informal loan of personal copies. There’s a prize pack up for grabs for the best question asked on the day: a collector’s set of all three editions of ‘Olmec Obituary’. All participants will also leave with a small gift pack of book-related items. The Library Lovers Bookclub is on Sunday 13 November, 1pm till 2:30pm. We’ll meet in the Ferguson Room, upstairs from the National Library foyer (it’s the glass room above the bookshop). The event is FREE, but please RSVP as places are limited. Tickets via eventbrite or facebook. Gold coin donations gratefully received. All money collected will be donated to a worthy cause. With special thanks to the National Library of Australia. There won’t be snacks, but you can buy take-away coffees and the like from Bookplate cafe. Please get in touch if you need help with carpooling. Otherwise, there are buses that stop close by the Library or at Albert Hall. Bike racks are near the ramp to the library. Dr L.J.M. 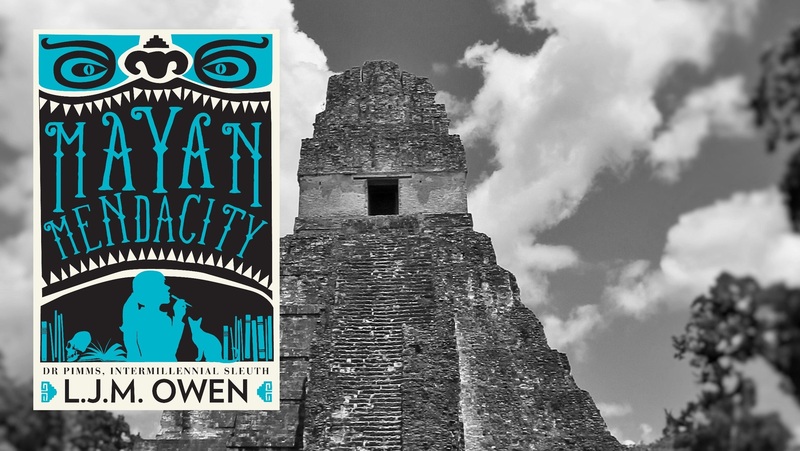 Owen, author of the ‘Dr Pimms, Intermillennial Sleuth’ series, escapes dark and shadowy days as a public servant by exploring the comparatively lighter side of life: murder, mystery and forgotten women’s history. Recipes in the series are tested under strict feline supervision.